Easy one bowl pancakes the whole family can enjoy on a busy weekday morning or lazy Sunday. I make pancakes at least once a week, sometimes more. They are by far my sons favourite breakfast comfort food. For me, pancakes are heavily tied to memories of my dad in the kitchen. As a young girl, I recall my dad having three specialities - grilling, spaghetti and weekend pancakes. But the taste of the pancakes is not what I recall. It was the two things he could do with them - make them without measuring and flip them in the air. Now he did use a mix (sorry dad) but he never measured anything. Just a tilt and a shake of the pancake mix box into the bowl, then some milk. It's all about consistency, he would say. My sister and I (being around 10 & 6 respectively) would watch in amazement. With just an effortless flick of his wrist those pancakes executed double, sometime triple axles in mid air. I've come to learn that flipping pancakes in the air is not particularly difficult (again, sorry dad). And 30 years later I find myself flipping pancakes in the air much to the astonishment and amazement of my own child. We have however ditched the box of pancake mix in favour of this super easy, one bowl, homemade version. My favourite recipes use the least amount of bowls and spoons. You heard it hear first. Wet into dry or dry into wet (can you tell I'm not a baker ) does not need to apply to pancakes. There is absolutely no need to wash two bowls on what is either already a busy week day morning OR a lazy Sunday. One large bowl. It was one of the best pieces of advice I took away from another blogger. She said, always said grab a bowl bigger than you think you will need. It's so true. These pancakes are half whole wheat and half all purpose white flour. I do use oil. I have tried using other fats but a little oil works best for me in this recipe and is less hassle then melting butter or coconut oil. 30 extra seconds? Who has that kind of time ;) There is no added sugar; because we use maple syrup I find it's not necessary. Like my dad, I rarely measure anymore. You may find you need a little less flour or a little more liquid. After a few batches, you will see it does become all about consistency. I hope you make these one bowl pancakes one morning and they bring smiles and satisfy bellies for the loved ones in your house. And if you have wee ones, you have to try the pan flip. Maybe practice once or twice when they are not around. I suspect my dad did. PS...if you do enjoy, you may like these waffles. My mother in law taught me how to make them a hundred years ago and they are still the best waffle recipe I have found. PPS...these photos are part of an article I did for Food Bloggers of Canada on food styling "stacks". You can read the full article here. 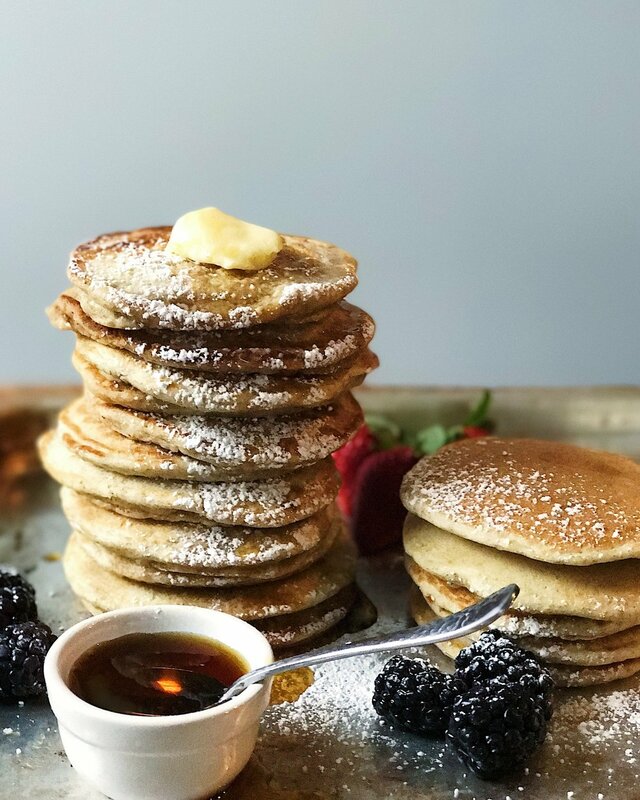 Easy one bowl pancakes the whole family can enjoy! Butter - for frying the pancakes. In a large bowl (preferably with a spout), add the flours, baking powder, baking soda and salt. Mix until well combined. Create a small well in the centre of the flour and add the milk and white vinegar. Let stand for one minute. Then add oil, egg and vanilla. Mix until well combined but do not over mix. Let the mixture stand for about five minutes before cooking. Head a cast iron pan with 2 teaspoons of butter. (or you can use a non stick pan) over medium heat. Pour (or scoop about 1/4 cup) a small amount for each pancake. 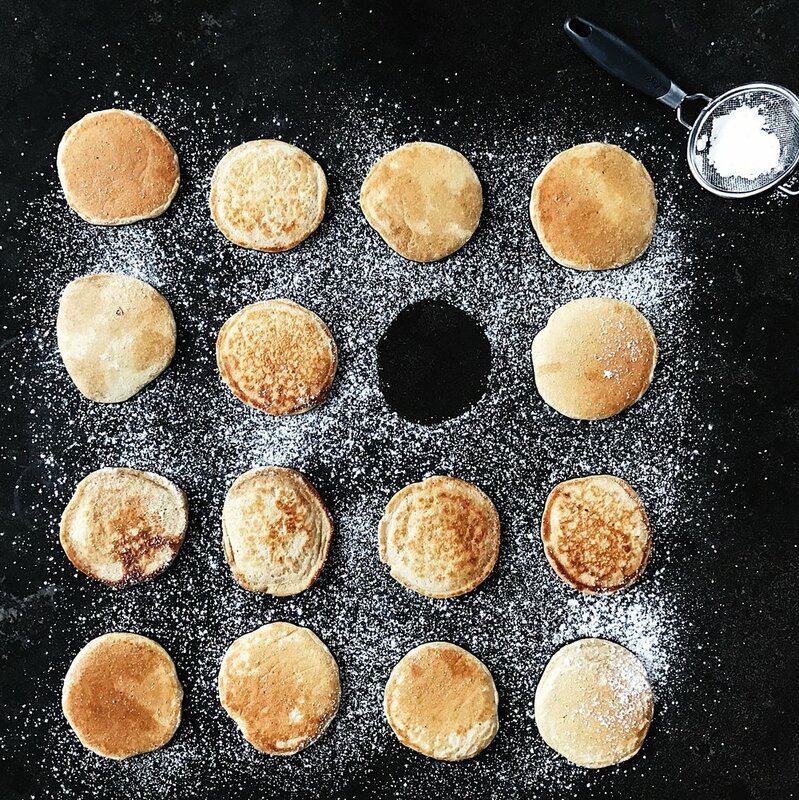 When bubbles start to pop, flip the pancake. Leave for one minute and then remove to a cooling rack. Do not stack the pancakes or put them on a plate/counter as they will steam and get limp. Top with yogurt, whipped cream, syrup or fruit. To minimize the mess: Use one large bowl (preferably a large glass mixing bowl with a spout, one wooden spoon, one 1/4 cup measuring cup and one 1/2 teaspoon measuring spoon and you should not need to dirty any extra dishes.